Handmade by one of the world’s greatest-living independent watchmaker, the Flying Triple Axis Tourbillon is nothing short of poetry in motion. 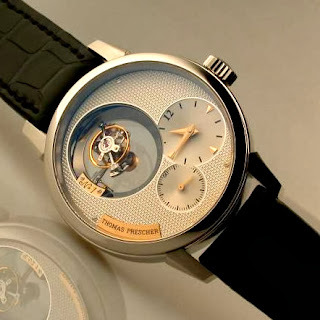 To see the tourbillon rotate on not one or two but actually three separate axes is breathtaking. Each piece is custom built to the owner’s specifications and you will not find a Thomas Prescher Flying Triple Axis Tourbillon in any store in the United States. This is a watch that only those in the know know about. And in this case, knowing is all the battle.